Money, finance and security businesses are vulnerable to constant threats. Rial CCTV Camera understands the unique needs of these industries and offer reliable solutions that you can bank on! Rial CCTV Camera ’s Smart Banking Surveillance Solution boasts powerful, intelligent functionalities. These functionalities are embedded with advanced technology to help you integrate your financial facilities – from branch offices to service centers to treasuries – into a centralized monitoring solution that is easy to implement, manage and integrate. Rial CCTV Camera helps you conduct effective surveillance of bank assets, manage the security of your clients and personnel, protect restricted areas, and secure ATM areas with unwavering reliability. 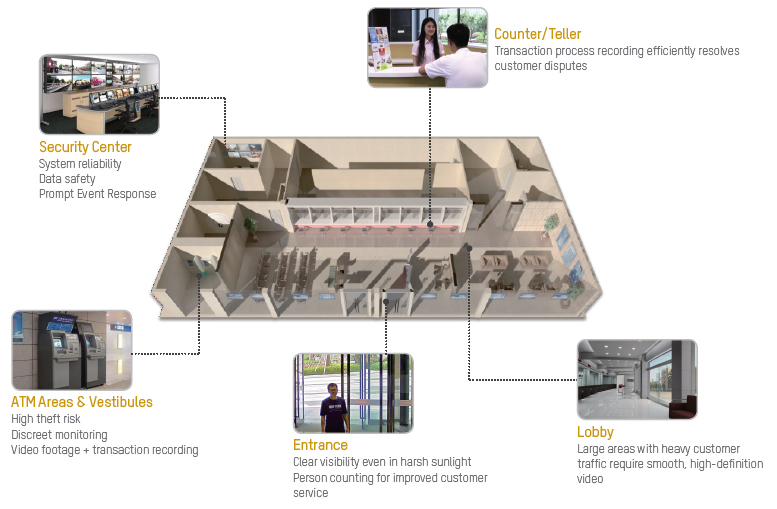 And there’s more – Rial CCTV Camera surveillance solutions also improve accountability, efficiency and customer satisfaction for better business. Rial CCTV Camera provides a complete solution for ATM machine and its cabin area’s safety. HD video, discreet pinhole design, dual lens for different direction viewings. Dedicated form factor, support transaction information overlay. Only one wide angle camera to cover all the in-cabin area. Note:Transaction Data Overlay With video for better customer dispute solving and enhance transaction safety. Rial CCTV Camera provides a complete solution for ATM machine and area safety. In a bank agency, the entrance and lobby areas are the most frequented locations that require high detailed facial images even in high lighting contrast environment. Rial CCTV Camera Lightfighter series cameras can reach up to 140dB Wide Dynamic Range for obtaining a crystal clear image quality even in high contrast sunshine environment. From fixed box camera with dedicated wide angle lens to panoramic fisheye camera, Rial CCTV Camera has a full range of 4K products to meet highest definition requirement. High volumes of financial transactions each day – from signing documents to approving loans – may leave institutions vulnerable to customer misunderstandings or disputes. required of individuals during financial transactions. Storing critical video footage of daily operations in a bank’s security center is a core component of a total CCTV system. It requires the utmost reliability and manageability for data protection and security operations.